RealAutoTips. - As we know that boxer Floyd Mayweather beat Manny Pacquiao won a controversial though in a boxing match is touted as the fight of the century. Certainly the results of boxing, Mayweather increasingly add to pot. 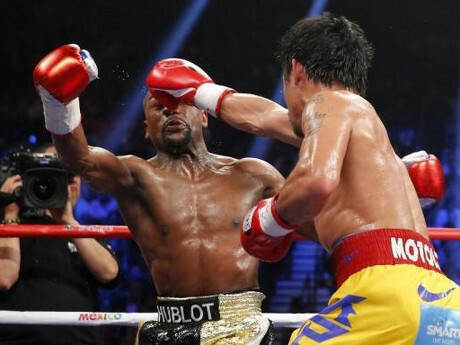 From the results his fight with Pacman, Mayweather reportedly earn money of US $ 180 million. So with the money for it, Mayweather could buy any car he thought was nice. Moreover, the fact that Mayweather is a car enthusiast. According Detikoto, Thursday, 07/05/2015 that Mayweather usually shopping car in the early morning, so unnoticed people in one car dealership customers. Uniquely him pay with cash! The money was put them in a backpack, so the car dealership personnel to be patient enough to count money Mayweather. If the car's price, maybe the clerk was not too difficult, this cost could reach millions of dollars, imagine how many sheets of cash to be counted right? Now with the results of yesterday's opponents Pacman boxing match, roughly like what deserves car purchased Mayweather? Autoevolution sites provide question. The first possibility is the Ferrari car. Mayweather already has several units such as the Ferrari 458 Italia and even the Enzo, so it looks like he will target the LaFerrari car. To get this car is very difficult, Ferrari implementing strict requirements for prospective owners LaFerrari. Otherwise LaFerrari, Mayweather could be offered the latest car Ferrari 488 Spider. The next car is a Rolls-Royce. Because Mayweather is a figure that materialistic, he definitely targeting the best that can be offered by this British car. Then there is the Lamborghini Huracan SV. Considered reasonable for Mayweather to get a Lamborghini. Moreover, he included Lamborghini collector. There is another McLaren sports car, probably the most 'cheap' first, McLaren 570S which sold for US $ 184.9 million. Although relatively cheap, does not mean that McLaren would not fit juxtaposed with a fleet of luxury cars owned by Mayweather. Lastly, if Mayweather wants an environmentally friendly cars, he can choose the BMW i8 or also other luxury sports cars such as the Tesla Model S P85D.